In 2016, one of the candidates for Oxford Dictionaries’ Word of the Year was “hygge.” Pronounced “HUE-guh,” this Danish word has no exact equivalent in English. Its closest translation is “coziness,” but it means a lot more than that. It ties in ideas of companionship, wholesomeness, and contentment, all wrapped up into one harmonious whole. The great thing about the hygge trend is that it’s incredibly easy to embrace on a budget. Most of the things that are central to the hygge lifestyle – such as candles, home-cooked meals, and intimate gatherings of friends – cost little or nothing. 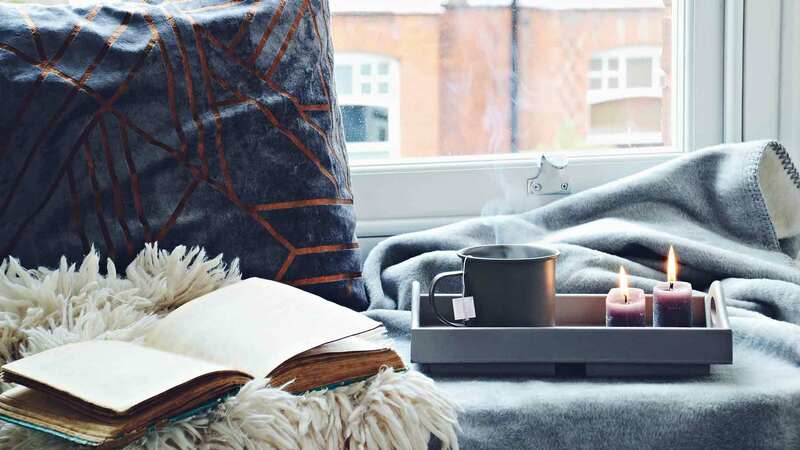 If you’re trying to live a healthy, happy life on a small budget, jumping on the hygge bandwagon can be a great way to do it. The word “hygge” comes from an Old Norse word, “hugga,” which means to comfort or console. This is also the source of the English word “hug,” and that connection echoes in the way “hygge” is used today. Hygge is all about warmth, comfort, and closeness – all the feelings you get from a hug. Danes use “hygge” as both a noun and an adjective. However, they also have a separate adjectival form, “hyggelig” (pronounced “HUE-gah-lee”), to describe things that have hygge. They also use “hygge” as an add-on to other words, as in “hyggebusker” (slouchy pants that you only wear around the house) and “hyggekrog” (a cozy reading nook). In Denmark, hygge is more than just a word – it’s a central part of the culture. Wiking, CEO of the Happiness Research Institute in Copenhagen, says in “The Little Book of Hygge” that the idea of hygge is as fundamental to Danes as freedom is to Americans. He also argues that this is one of the reasons happiness economists rate Denmark as the happiest country in the world, in spite of a wet, chilly climate where it rains for nearly half the year. 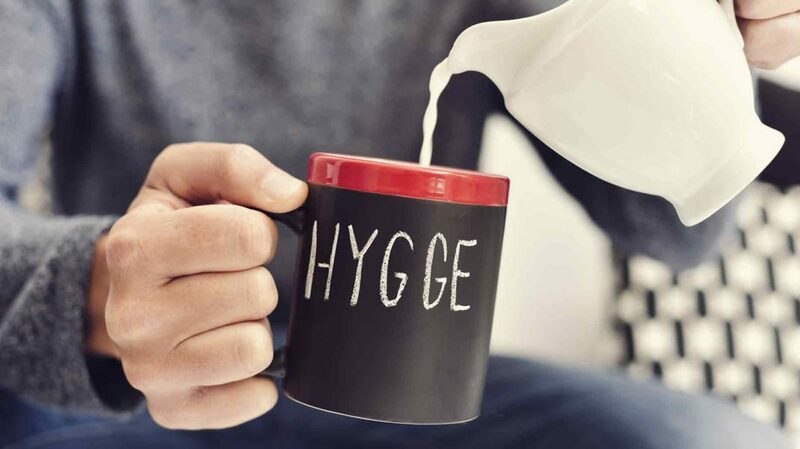 Other Scandinavian countries, with their generous social programs, also score high – but what gives Denmark the edge is the way hygge fills every corner of everyday life. Comfort. In his book, Wiking relates one of his favorite hygge memories. He’s spending Christmas Day with a group of friends in a cabin in the woods. After a long hike in the snow, they sit together around a log fire, dressed in sweaters and wool socks, sipping mulled wine. The whole scene exudes comfort: the warmth and crackle of the fire, the cozy sweaters, the hot wine, all set against the cold, snowy background. The only thing that could make it more hygge, they agree, would be to have a storm raging outside. Relaxation. This isn’t the same thing as sitting still. For instance, taking a walk through the woods on a fall day, especially with a group of friends, can be very hygge – but it has to be a leisurely walk. Getting some exercise is fine, but any suggestion of haste or hurry spoils the mood. Claus Meyer, a Danish chef, explains in the New York Times article that when Danes gather for a meal, they often start with appetizers, then go out for a two-hour walk before the main meal. This unhurried pace is part of the hygge experience. Connection to Nature. Though it’s good to be comfy indoors, a full hygge life involves spending time outdoors too. John Crace of the Happiness Research Institute, writing for The Guardian, says Danes even enjoy going out in the rain. Living hygge means enjoying the sights, sounds, and smells of nature: a thunderstorm outside the window, geese honking overhead, flowers in bloom. Cooking with fresh, natural ingredients is also part of the hygge lifestyle; in “How to Hygge,” Johansen includes recipes for New Nordic Cuisine specialties, such as muesli, fruit compote, and roast lamb. You can give your home a hyggelig feel by bringing the outdoors in with fresh flowers or bare branches, or by turning off the electric lights and lighting some candles so you can watch the flames. Even line-drying your laundry, with your clean towels snapping in the breeze, is a way to feel hygge (and save on laundry costs at the same time). Simplicity. Hygge is all about enjoying the simple things in life, not chasing after thrills. 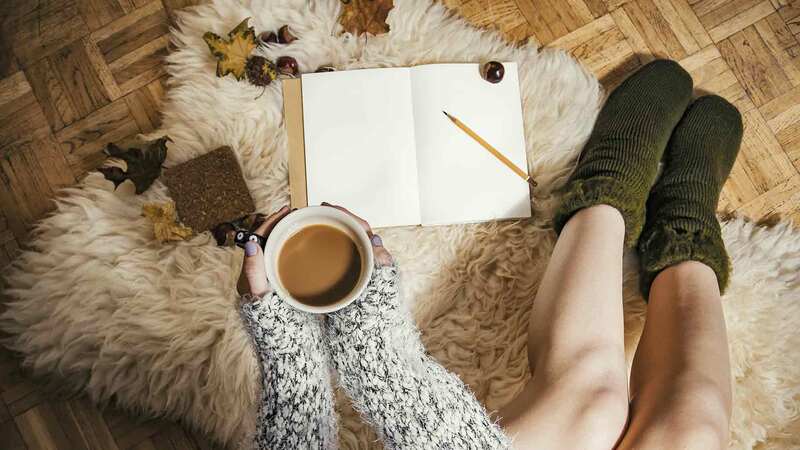 Beauchamp says it requires “the ability to not just be present – but recognize and enjoy the present.” Sipping your morning coffee in your bathrobe while sitting by an open window – or better still, out on the porch – listening to the birds sing is hygge. Dashing into Starbucks for a to-go cup on your way to work, while simultaneously listening to music and checking Facebook on your phone, is not. Articles about hygge tend to focus on wintertime activities. The cold, dark days of winter are a perfect time to get cozy indoors, with candles, throw blankets, hot chocolate, wooly sweaters, and a good book or a TV show to binge on. Lots of hygge foods, like pancakes, porridge, and hot stew, are also ideal for winter. However, that doesn’t mean there’s no room for hygge in the summer. Warm-weather hygge centers more on outdoor activities, such as picnics, cookouts, bonfires, or outdoor movie nights. Summertime hygge is all about companionship and connecting with nature, taking advantage of the warm weather while you can. You can also define a hygge life by what it doesn’t include. For instance, going out to a trendy dance club, with flashing lights and pulsing electronic music, is about the most un-hygge activity ever. Many other common features of modern life, such as obsessively checking social media, going on a shopping spree at the mall, and eating fast food, are also the exact opposite of hygge. Coincidentally, anti-hygge activities like clubbing, eating out, and shopping also tend to have something else in common: they’re expensive. Hygge activities, on the other hand, tend to be cheap or even free. That makes the hygge lifestyle a perfect choice for living the good life on a tight budget. Of course, like any other trend, hygge can be used as an excuse to sell pricey products. Charlotte Higgins, writing for The Guardian, talks of seeing hygge “used to sell cashmere cardigans, wine, wallpaper, vegan shepherd’s pie, sewing patterns, a skincare range, teeny-tiny festive harnesses for dachshunds, yoga retreats and a holiday in a ‘shepherd’s hut’ in Kent.” And of course, there’s no shortage of books that you could spend money on to learn more about hygge life. The hygge lifestyle, by contrast, is within anyone’s grasp. Like the voluntary simplicity movement, it focuses on slowing down, embracing nature, and making more time for friends – all things you can do without spending any money at all. Ask any Danish person, and they’ll tell you that the easiest way to create a hyggelig atmosphere is with candles. Danes go through more candles than any other nation on earth – a whopping 13 pounds of candle wax per person each year. They even use the term “lyselukker,” which means “someone who puts out the candles,” to refer to a spoilsport. Fortunately, it’s easy to find candles at bargain prices. Stores like IKEA, Target, Bed Bath & Beyond, and Amazon carry large bags of at least 100 tea lights for under $15. Just make sure to use them safely: Don’t put them on or near anything flammable, keep them out of reach of pets and small children, and never leave a burning candle unattended. If a tiny candle flame is cozy, a fire is even cozier. It feels much more immediate to watch an actual flame than to have light and heat delivered to you through electric bulbs and central heating. In the summertime, you can gather around a campfire in an outdoor fire pit – permanent or portable. Even cooking a meal over a barbecue grill gives you a chance to watch the flames and maybe toast a few marshmallows. In the winter, if you’re not lucky enough to have an indoor fireplace, do the next best thing and stream a video of a crackling fire on your TV. You can’t feel the heat, but you can still watch the flames flicker and hear the logs pop. There are free fireplace videos available on YouTube that run for three to 10 hours. There’s no way to feel really cozy while wearing a business suit. To get hygge, you need to change into something easy and comfortable. Heavy sweaters and knitted socks are classic choices for wintertime because they keep you warm, which is essential to the hygge mood. A pair of hyggebusker (sweats or other pants you’d never wear in public) complete the outfit. Danes love to go for long walks in all kinds of weather – rain or shine, winter or summer. Walking is especially hyggelig when you do it with a friend or a group of friends. It’s a chance to talk and enjoy each other’s company without spending a cent. But even taking a walk on your own, or with your dog, is a way to get closer to nature and take a break from a busy schedule. Bicycles are very popular in Denmark. Denmark.dk, the nation’s official website, says the capital city of Copenhagen is known for its cycling culture and is recognized as the first official Bike City in the world. Bikes are hygge because they move at a slower pace than cars, giving you time to enjoy the scenery. If you already own a bike, consider cycling to work. Numerous studies show that people who bike to work are both healthier and happier than people who drive. If you don’t have one, see if you can buy one secondhand. Sites like Craigslist and eBay often have basic models in good condition for $100 or less. Another option is to join a bike sharing program, if your city has one. Home cooking is much more hyggelig than eating out, and it’s doubly so if you share the meal with a few good friends. To make your dinner party as hygge as possible, focus on comfort food rather than haute cuisine. Fresh and natural ingredients are good, but a fancy presentation is unnecessary. Popular dishes for Danes include pancakes, meatballs, and rich cakes, but you can serve whatever feels most comforting to you – whether that’s your mother’s chicken soup or your favorite apple crumble. If cooking for a crowd is more work than you can handle, hold a potluck instead. That way, all your friends can bring their favorite cozy dishes and share them, which bumps up the hygge quotient even more. The quintessential hygge drink in Denmark is glogg, or spiced mulled wine. However, pretty much any hot drink – coffee, tea, hot chocolate – can add to a hyggelig atmosphere. On a cold, wet day, there’s nothing cozier than sitting indoors with a steaming mug in your hand, and it’s a pleasure that costs only pennies. Reading is a hygge activity because it’s a way to slow down and detach yourself from the busy, fast-paced modern world. You can up the hygge factor by curling up on a couch with your book and a blanket, or in warmer weather, sitting outside to read under a tree. Watching TV can also be a hygge activity, particularly if you do it with friends. Scary shows are a particularly hygge choice, as long as they’re fictional; it feels extra cozy to watch something frightening when you know you’re safe and snug in your home. Danes especially love police procedurals about deranged killers. The biggest hit show of this kind was “Forbrydelsen,” which not only gave viewers a good scare but also spawned an entire website, SarahLundSweater.com, devoted to the heavy, patterned wool sweater worn by the female detective. (An American adaptation of this series, called “The Killing,” is available on Netflix.) Stick to fictional scares, however; watching something genuinely scary, such as the news, creates entirely the wrong mood. Hosting a board game night is also a very hygge way to spend an evening. Tabletop games offer a way to have fun with friends at home at little expense and with no fancy technology. This ticks off three of the hygge boxes: companionship, relaxation, and simplicity. Having a sing-along in your house may sound like something straight out of the 1960s, but in Denmark, it’s still a common activity. “The Book of Hygge” notes that many Danish households have copies of a folk songbook, and they sing from it to “affirm the ideas of simplicity, cheerfulness, reciprocity, community, and belonging.” If you’d like to give this a try, a good American equivalent of this book is “Rise Up Singing,” which contains lyrics and chords for all kinds of singable songs, from traditional folk to the Beatles to Tin Pan Alley. What activity could possibly be cozier than cuddling? It combines nearly all the elements of hygge – comfort, relaxation, simplicity, and spending time with people you’re close to – in one. Snuggle under a blanket with your partner, your kids, your best friend, your pet – or all of them at the same time. It’s warm and joyful, and it costs nothing at all. The nice thing about the hygge lifestyle is that, in theory, it’s open to anyone. Because most hygge activities cost so little, no one needs to be barred from trying them on account of money. However, for many Americans, a much bigger problem is time. Unlike Denmark, where people at all levels of society enjoy plenty of leisure time, the U.S. is a very fast-paced society. Everyone seems to be busy all the time – the rich even more than the poor. In fact, it’s almost a point of pride for Americans to brag about how busy we are and how little time we have to relax, because it makes us sound successful and important. But this hectic lifestyle is exactly what makes hygge so useful for us. It forces us to slow down and relax – something that doesn’t come naturally to many of us. Making time in our schedule for long walks, potluck dinners, and board-game nights gives us a chance to step off the treadmill of working, earning, and spending, and just enjoy. And if Denmark is any example, we’ll all be happier for it. What other ways can you think of to bring hygge into your life?